Last year we told you a little about Sky Pirates of Neo Terra, a multi-media project featuring artwork by the great Camilla d'Errico. 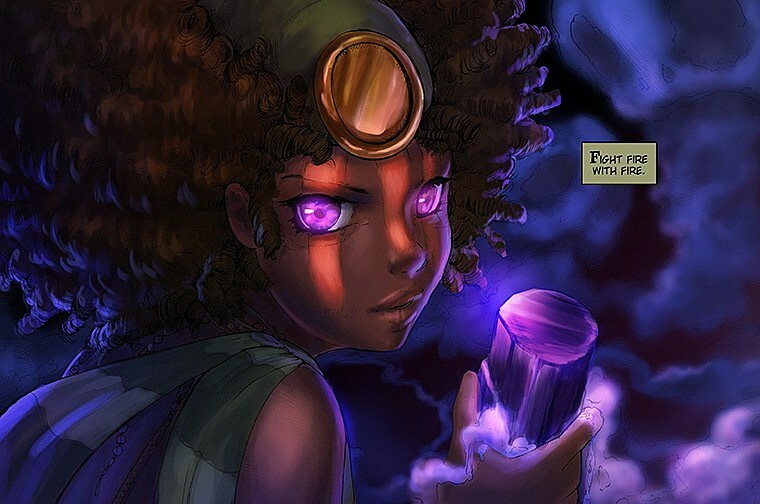 Scripted by Kurtis J. Weibe, Sky Pirates features a diverse cast of characters in a lush, Miyazaki-inspired fantasy/steampunk-esque world that's so far in our future that its people cannot even remember the past. Called Neo-Terrans, these people live in disparate tribes which compete in an annual race of gildewings, personal flying machines powered by both magic and technology. Neo Terrans occasionally discover machines from the ancient world such as vehicles. Interestingly, the Neo Terrans actively refuse to investigate what purpose these artifacts may have served their ancestors, assuming them to be tools of war. Instead, the Neo Terran Mechanics (respected and valuable members of the various tribes of Neo Terra) salvage the machines and adapt them for their own purposes, like building gildewings or mining implements. One of the things the tribes mine are crystals that control various magics. The most dangerous is the Death Crystal, or Dark Magic. 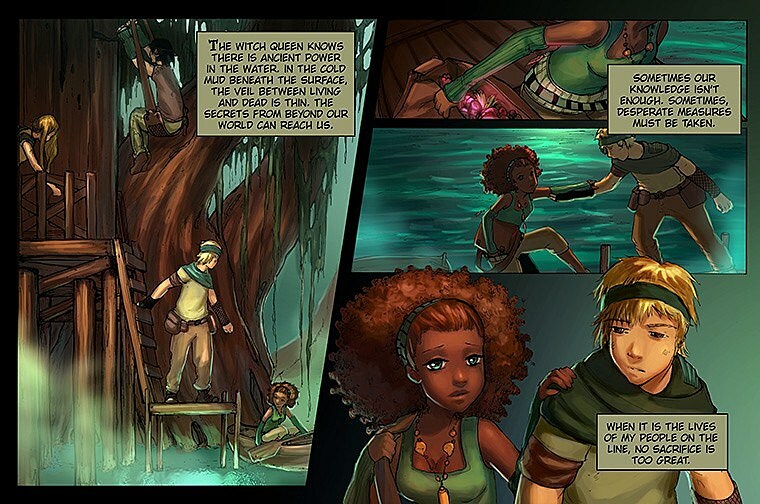 Only the Sky Pirates villain called the Witch Queen masters this nasty stuff, but in the new webcomic by d'Errico and Weibe, it seems the desperate young leader of the Shadow Marsh is going to do the unthinkable to protect her people. Sky Pirates was developed by Day 21 Studios not just as a comic but also as a video game, something in the vein of the great racers like Mario Kart or F-Zero. After a long wait, the game is finally ready to launch. 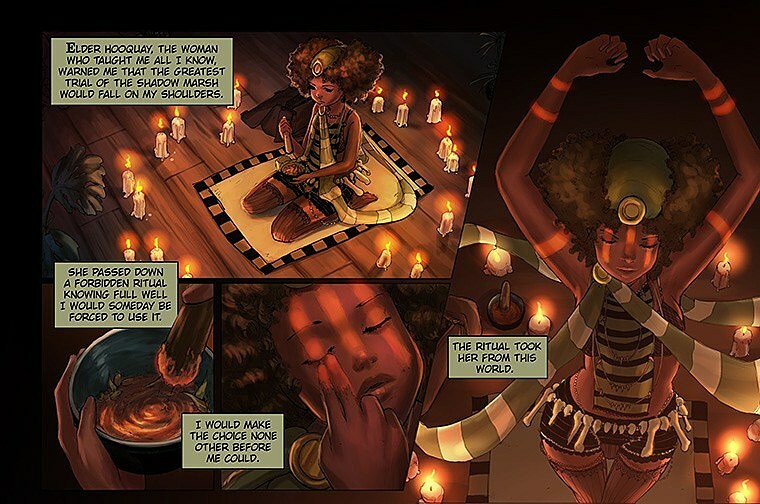 In support of the game, d'Errico and Weibe have been continuing a series of webcomics that flesh out the world and characters of Neo Terra, and they're as lovely as illustration fans have come to expect from the very talented d'Errico. Check out the new webcomic below. 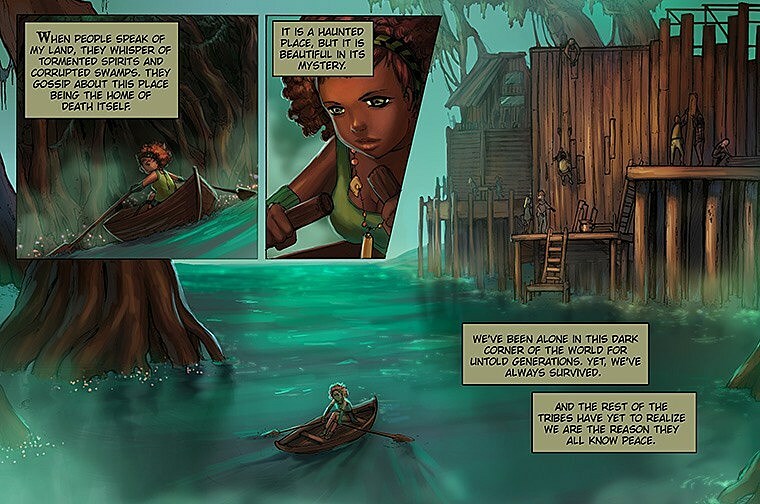 You can catch up on the rest at the Sky Pirates website.